With so much work to be done in this challenging political climate, it feels hard to pause for anything, including saying “thank you.” But it’s also more important than ever to tell you how grateful we are for you and the rest of the BCAction community. Thank you for being part of our community. Thank you for your fierce, passionate activism. Thank you for your steadfast commitment to demanding an end to the breast cancer epidemic that is taking 40,000 women from us every year. Our challenges are greater than ever in this political climate, and that’s why our work is more important than ever. None of us can create the change we need on our own, but together we are powerful. Throughout our 25+ years of doing this work, together we’ve proven again and again that change happens when we come together to demand it. Thank you for calling out pinkwashers, for demanding a less toxic world for all of us, for demanding cancer treatments that are effective and affordable, for calling on the cancer industry to put public health before corporate profits. 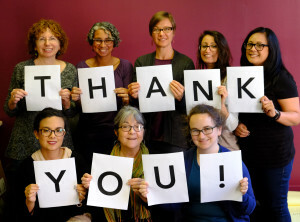 Thank you for working to create a more just and equitable world for all of us. We are so grateful for your loyalty, your activism, your support, and your courage. Challenging the status quo isn’t easy. Working together to address and end this epidemic isn’t easy, but by working together, we make it possible. We are proud to work alongside you. Thank you.